UPDATE: PLEASE SEE THE CHANGES TO THE "PRODUCT RECALLED FOR REPAIR" SECTION BELOW REGARDING THE LIST OF AFFECTED SERIAL NUMBERS. Canon U.S.A., in cooperation with the U.S. Consumer Product Safety Commission, is recalling the Canon EOS REBEL T4i Digital SLR camera with certain serial numbers (see below). The front rubber grips of some units of the Canon EOS REBEL T4i Digital SLR camera (EOS 650D/EOS Kiss X6i overseas models) can change color (turn white) after a short period of time. Customer support for this phenomenon is described below. We take pride in the quality and performance of our products, and apologize for any inconvenience. We offer our sincerest apologies to any customers who may be inconvenienced. The front rubber grips of some EOS REBEL T4i units produced in certain lots between May 31st through June 27th, 2012 may turn white after a short period of time. We have determined after inquiry with the rubber manufacturer and analysis, that the white substance is zinc bis (N,N’-dimethyldithiocarbamate). Zinc bis is not used in the production of this product. However, the quantity of rubber accelerator used in the affected production lots was slightly higher than usual. As a result the rubber grips may turn white due to a chemical reaction with the rubber accelerator and other substances. High temperature and high humidity may contribute to this condition. Zinc bis (N,N’-dimethyldithiocarbamate), which becomes deposited on the rubber surface, is created as a result of this chemical reaction. Some EOS Rebel T4i digital SLR cameras sold from June 11 through August 1, 2012 may be under recall for repair. You can use the serial number to check whether your camera is affected by this phenomenon. If the sixth digit of the serial number is "1" please follow the procedure below. 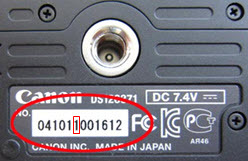 If the sixth digit of the serial number is "2" or higher, your camera is not under recall for repair. We have added new serial numbers to our system since this Product Advisory was first posted on July 13, 2012. Please enter the serial number of your camera on our website, following the directions below, to determine if your camera needs to be returned to Canon USA for repair. Because the website has been updated, even if you checked your serial number on our website prior to August 1st, please check it again. Enter the 12-digit serial number from your camera (refer to the image below) in the Serial Number field, then click the Submit button. One of the following messages will appear. "Your camera is NOT affected" → No further action is required. "Your camera is affected" → Please see the Support section below. Note: Please double check the 12 digit serial number you entered before you click on the Submit button. To enter another serial number, click on your browser's Back button after a message appears. The amount of zinc bis detected during our testing was minimal. It is possible for zinc bis, in the small amount found in the camera grips, to cause allergic reactions, such as a rash, when it comes in contact with skin of sensitive persons. In addition, if eyes are rubbed after contact with the substance, symptoms such as red eyes may develop. As a precautionary measure, thoroughly wash your hands with water if they have come in contact with a rubber grip that has turned white. If any medical symptoms develop, please consult your physician immediately. Affected cameras that exhibit this phenomenon will be inspected and the rubber grips will be replaced free of charge. If you own one of the affected cameras please contact our Customer Support Center. This information is for residents of the United States and Puerto Rico only. If you do not reside in the USA or Puerto Rico, please contact the Canon Customer Support Center in your region. Please register your EOS Rebel T4i. By registering, we will be able to notify you via email when service updates are available.